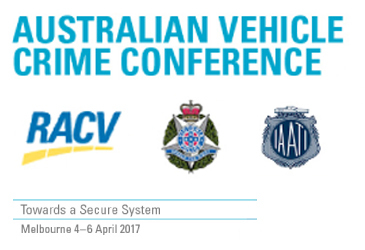 The Australian Vehicle Crime Conference was held from April 4 to 6 at the RACV City Club, organised by the NMVTRC in conjunction with Victoria Police and The International Association of Auto Theft Investigators (IAATI). The AVCC was proudly sponsored by RACV. The conference program was based around the themes of Diverting Young Offenders, Disrupting the vehicle laundering and separated parts markets and Building stakeholder capacity/ promoting innovation. The AVCC provided an excellent forum for sharing experiences and expertise in the field of vehicle crime prevention. The conference brought together more than 240 representatives from policing and law enforcement, crime prevention, academia, general insurance, motor trades, local government and community sectors to review current national and local strategic and operational responses to vehicle crime. The speakers included Assistant Commissioner Robert J Hill, Youth expert Dr. Monica Thielking and international speakers, Detective Chief Inspector Oliver Little, City of London Police who highlighted issues around Insurance Fraud via manipulation of the legal system and industry practices and Detective Chief Inspector Paul Betts, Midlands Police who discussed Multi-agency approach to managing young offenders. Executive Director of the VACC, Geoff Gwilym was also invited to speak at the conference. Mr Gwilym’s presentation outlined the absence of formal end of life vehicle arrangements in Australia and how this has a significant impact on businesses and communities. Mr Gwilym described how the industry has become frustrated with the lack of action from regulators and are seeking a shared solution to both remove cash-for-scrap dealings and support an industry led and government supported national system for the acquisition and decommissioning of ELVs. Select presentations on the key themes and issues were complemented with expert panel sessions in which conference participants were able to pose questions to one or all of the sessional presenters. The conference was conclude with a brief speech from the Police Minister, the Hon. Lisa Neville. The conclusion of The Australian Vehicle Crime Conference reinforced the NMVTRC’s assessment that incidence of residential burglaries to access the keys of secure vehicles is the number one community education challenge for police, insurers and crime prevention partners. The challenges presented by theft for scrap methodologies comes a close second.